Audeze's LCD-i4 £2400 headphones have drivers 'the width of a blood cell' | What Hi-Fi? A bit like Walt Disney, the LCD-i4s have been cryogenically treated to give extra cable strength. What weighs 12g per ear, and has a diaphragm the width of a blood cell? No? 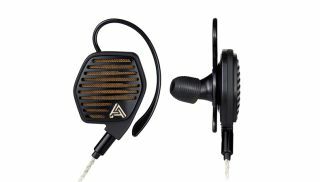 This isn't the start of some terrible joke - it's Audeze's latest in-ear headphones, the LCD-i4s. They've some impressive qualities on paper: housings made of magnesium (to try and prevent ringing and smearing of the mid- to-high frequencies), and a new cryogenically treated braided cable made of silver-plated copper with Kevlar threads for additional strength. Each earphone features a single 30mm driver, which means it has a "coherency of sound lacking in multi-driver designs" (according to Audeze). But because of their 35 ohms impedence, the company also recommends they're used with a high-quality headphone amplifier. You don't have long to wait if you want to try them out - the LCD-i4s will be available from late June, priced at £2400.